The full name of the pioneering painter and sculptor “Shaw”, who lived in Jocotepec from 1967 to the mid-1970s, is Donald Edward Shaw. Shaw was born in Boston, Massachusetts, 24 August 1934, and passed away in New Mexico on 26 December 2015. He always preferred to be known in the art world by his surname alone. Shaw attended the School of the Museum of Fine Arts in Boston (1954) and subsequently studied under sculptor John Bergschneider. He often worked in mixed media, and during the Jocotepec stage of his distinguished artistic career, specialized in presentations involving exquisitely-designed and handsomely-crafted boxes and box frames. Shaw taught and lectured at several colleges and universities including the Institute of Contemporary Art (ICA), Boston (1957), Harvard (1958; 1959), the University of Houston, Southern Arkansas University and Rice University. He was professor of painting at School of Art in San Francisco (1961) and gave workshops in Oakland, California (1963) and in Jocotepec (1967). When he sought new inspiration in the mid-1960s, he flipped a coin to decide between Alaska and Mexico. and then, blindfolded, stuck a pin in a map of Mexico, thereby choosing the small coastal town of Barra de Navidad, where he came into contact with the indigenous Huichol people. Before long, as a result of a chance meeting with artist-photographer John Frost and his wife novelist Joan Frost, in a Guadalajara restaurant, Shaw had relocated inland, to the village of Jocotepec, where the Frosts resided, at the western end of Lake Chapala. He first settled in Jocotepec in 1967 and lived there more-or-less full time until around 1972. For the following five or six years, he divided his time between Houston and Jocotepec. During his years in Jocotepec, Shaw (described by a female admirer from that time as “drop-dead gorgeous”) was an active catalyst for local artists and became a tireless promoter of artistic events. Shaw’s friends and artistic colleagues in the Lake Chapala area included fellow serigrapher John Frost, Phyllis Rauch and her husband Georg Rauch, Tom Brudenell, Peter Paul Huf, Eunice (Hunt) Huf, sculptor Alice Bateman, poet Peter Everwine, poet-painter John Brandi, and many others. Shaw was inspired by the power of indigenous music and culture, and greatly admired the pioneering work of Peter Everwine in revealing, through translation, the remarkable power of Nahuatl poems. Shaw was a founder member of the local (Lake Chapala) art group known as Grupo 68 (founded in 1968), alongside Peter Huf, his wife Eunice Hunt, Jack Rutherford and John Kenneth Peterson. Grupo 68 exhibited regularly (most Sunday afternoons) from 1969-1971 at the Hotel Camino Real in Guadalajara, at the invitation of the hotel’s public relations manager Ray Alvorado (a singer) and also held many group shows in Ajijic, both at Laura Bateman’s Rincón del Arte gallery, as well as (later) in “La Galería”, the collective gallery they founded at Zaragoza #1, Ajijic. In addition, the group also showed in Guadalajara with José María de Servín, at El Tekare, and at Ken Edwards’ store in Tlaquepaque. 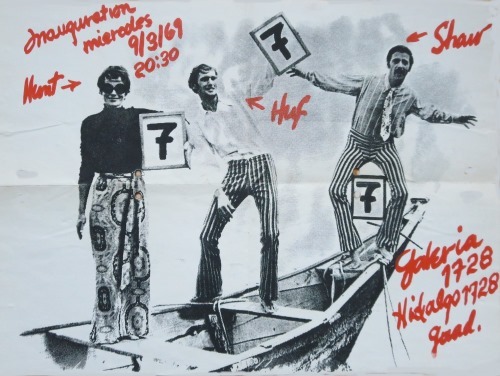 Another Grupo 68 collective show in April 1969 at La Galería, Ajijic, featured works by Shaw, John Kenneth Peterson, Charles Henry Blodgett (guest artist), John Brandi, Tom Brudenell, Peter Paul Huf, Eunice Hunt, Jack Rutherford, Cynthia Siddons and Robert Snodgrass. In June 1969, Shaw joined with John Brandi and Tom Brudenell in arranging the somewhat presumptuous “happening” in Chula Vista, mid-way between Ajijic and Chapala. Shaw’s contributions to this event included bound-up figures, and prints of symbols. 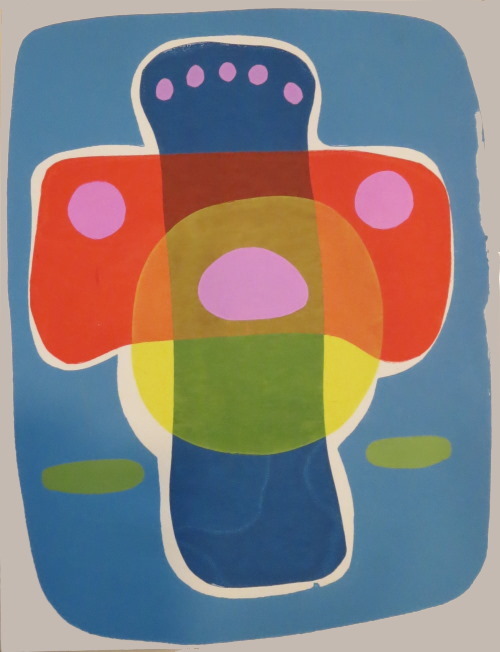 In 1971, he may have been among the group of artists who exhibited on 15 May 1971 at a “Fiesta of Art”, held at the home of Mr and Mrs E. D. Windham (Calle 16 de Septiembre #33). Other artists on that occasion included Daphne Aluta; Mario Aluta; Beth Avary; Charles Blodgett; Antonio Cárdenas; Alan Davoll; Alice de Boton; Robert de Boton; Tom Faloon; John Frost; Dorothy Goldner; Burt Hawley; Peter Huf; Eunice Hunt; Lona Isoard; Michael Heinichen; John Maybra Kilpatrick; Gail Michael; Bert Miller; Robert Neathery; John K. Peterson; Stuart Phillips; Hudson Rose; Mary Rose; Jesús Santana; Walt Shou; Frances Showalter; Sloane; Eleanor Smart; Robert Snodgrass; and Agustín Velarde. The image above shows a typical “decorated box” from this period. This piece, made of a Pepsi Cola box, wood, rock, bone, feathers and metal, measures 18″ (ht) by 14″ by 4″. Two decorated panels, of a series of five known as “Jocotepec: Dream Series” (1968) were included in the exhibition “Wood in Art” at the Museum of Fine Arts in Houston in 1979. During his time in Mexico, Shaw also did some graphic art, and designed the official logo for the Mexican news agency, Agencia Mexicana de Noticias (1968). In 1972, back in the U.S., he illustrated a cover for Southwest Art Gallery Magazine. Shaw has divided his years since Mexico between Texas, Arkansas and New Mexico. He lived and worked in Houston for many years (where he was on the faculty of the Museum School of the Museum of Fine Arts), then had his studio in Pine Bluff, Arkansas for twenty years, before relocating to New Mexico, where his studio-home is in Guadalupita, in the mountains above Santa Fe. While remaining primarily a sculptor, Shaw has enjoyed success in a variety of media. For example, in 1975, he arranged the first of several sky paintings, hiring pilots near Houston to leave trails of white smoke in specific patterns. In 1983, he designed and installed “Strata”, a 9-foot tall steel sculpture placed on the edge of the Balcones Escarpment just prior to the summer solstice. The semi-arid landscapes of Texas and New Mexico have inspired Shaw to develop new forms and works, including the small, two-sided, polychrome, sculpted steel “Betatakin” series. His group exhibits include the Institute of Contemporary Art, Boston (1956, 1957, 1959); Nova Gallery, Boston (1960); Allen Gallery, New York (1962);Pacific Gallery, Mendocino, California (1964); Gaspar Gallery, California (1967); Pacific Gallery, Mendocino, California (1967); La Galeria, Ajijic (1968); Rincón del Arte, Ajijic (1968); Galeria Palomar, Tlaquepaque (1968); Galería del Bosque, Guadalajara (1968); Arlene Lind Gallery, San Francisco (1968, 1969); Tekare Penthouse Gallery, Guadalajara (1969); Instituto Aragon, Guadalajara (1969); Vorpal Gallery, San Francisco (1971); Gallery of Modern Art, Taos, New Mexico (1971, 1972); David Gallery, Houston (1972);Biennial Invitational Exhibit of Texas Artists, Beaumont Art Museum (1974, 1978); Art Museum of South Texas, Corpus Christi (1975); Louisiana Gallery, Houston (1976, 1978); Pelham-Stouffer Gallery, Houston (1977); Art Museum, University of Texas at Austin (1979); “Wood in Art”, Museum of Fine Arts, Houston (1979); Blaffer Gallery, Houston (1980); Art from Houston in Norway, Stavanger, Norway (1982); Arts and Science Center for Southeast Arkansas (2012). 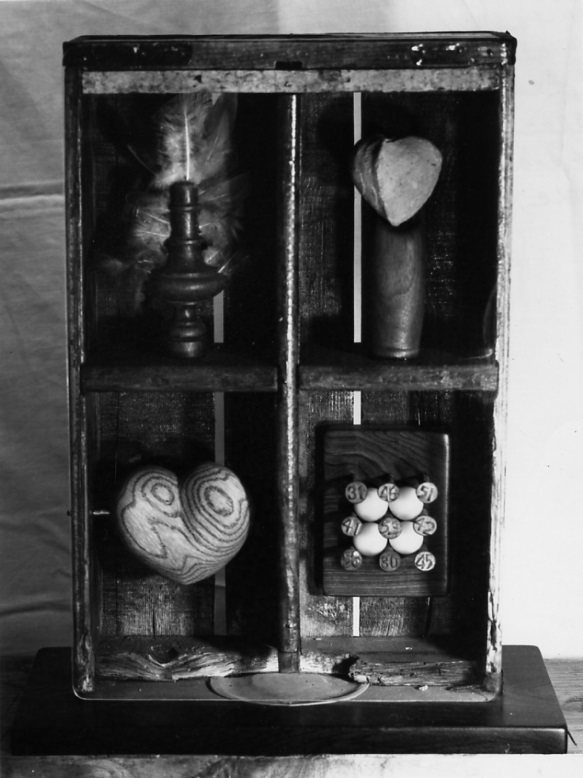 Shaw’s work can be seen in public collections in Arkansas, California, Colorado, New Mexico, New York, Texas, Virginia and Washington D.C.. For example, in Arkansas, sculptures or two dimensional pieces can be viewed at the Arkansas Arts Center and Bio-Medical Research Center in Little Rock, Hendrix College in Conway, Lyon College in Batesville, University of Arkansas Community College at Hope and Bank of America in Pine Bluff. Colin, Thanks for getting in touch. It’s great to hear you are Eunice’s nephew; we had such a nice visit a few years ago staying with your aunt and her husband in Germany. You are lucky to own a Shaw. They do not come up very often at auction and I honestly have no idea where you would be likely to find more to add to your collection. If I do happen to come across one, I’ll be sure to let you know. Tony.